Please take a moment to read a great editorial column published this week in the Ocala Star Banner. Editorial Page Editor Brad Rogers thoroughly dissects Governor Scott's sudden attempt to redefine himself as a champion of Florida's vanishing, algae-plagued springs. 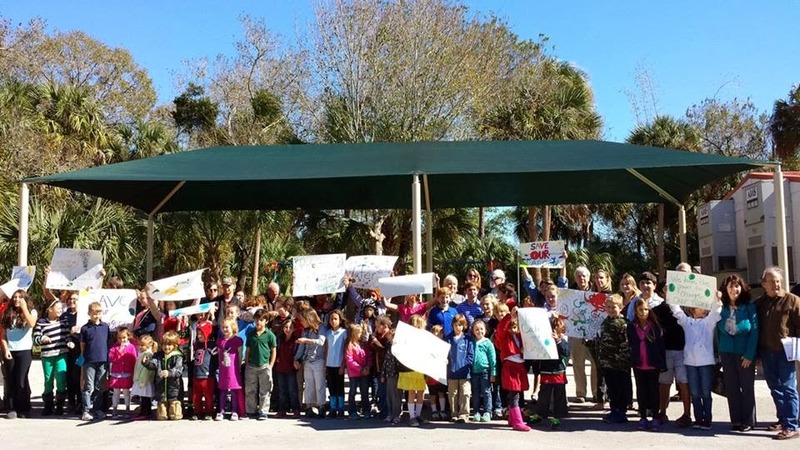 Sixteen Florida Cities, One Message: WE WANT CLEAN WATER! 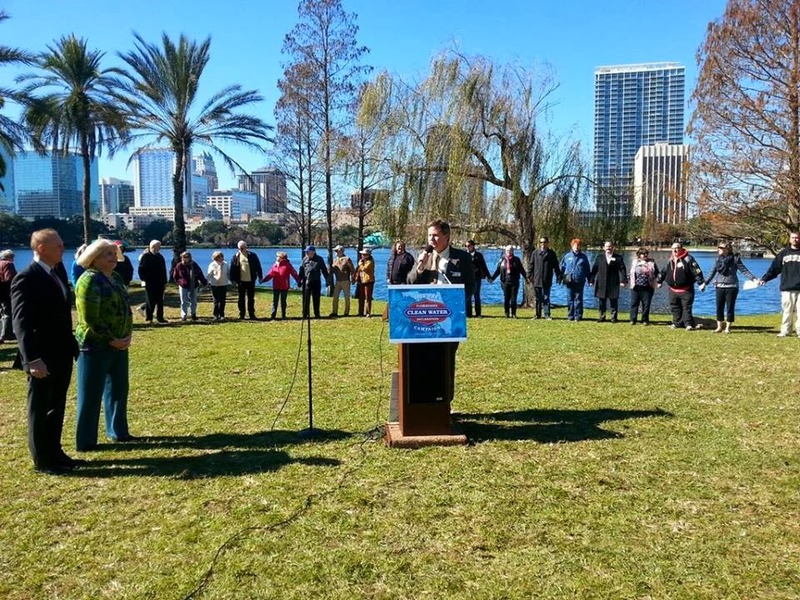 On January 22 concerned Floridians from more than 100 different organizations in 16 communities at risk from water pollution and the unrestrained over-consumption of water resources gathered to make a stand for clean water in Florida. “Commit to Clean Water” events were held in Boynton Beach, Bradenton, Ft. Myers, Ft. Pierce, Gainesville, Interlachen, Jacksonville, Key West, Palm Bay, Orlando, Naples, Ocala, Stuart, Tallahassee, Tampa, and Vero Beach. The public was joined by local and state level elected officials who want to join the fight to save Florida from the threat of lost jobs, lost quality of life and lost natural environments that we now face due to the degradation of our state’s waters; they were State Senator David Simmons and State Representative Linda Stewart (in Orlando), State Representative Michelle Rehwinkle-Vasilinda, and State Representative Alan Williams (in Tallahassee), State Representative Mark Danish, Hillsborough County Commissioner Kevin Beckner and Tampa City Councilwoman Mary Mulhern (in Tampa), State Representative Lori Berman (in Boynton Beach), State Representative Heather Fitzenhagen (in Ft. Myers), Manatee County Commissioners Michael Gallen and Robin DiSabatino (in Bradenton), Indian River County Commissioner Peter D. O’Bryan and Indian River County School Board Member Dale Simchick (in Vero Beach), St. Lucie County Commissioners Tod Mowery and Chris Dzadovsky (in Ft. Pierce), Jacksonville City Councilman Jim Love , Palm Bay City Councilwoman Michelle Paccione, Interlachen Mayor Ken Larsen and Alachua County Commissioners Mike Byerly and Robert "Hutch" Hutchinson. 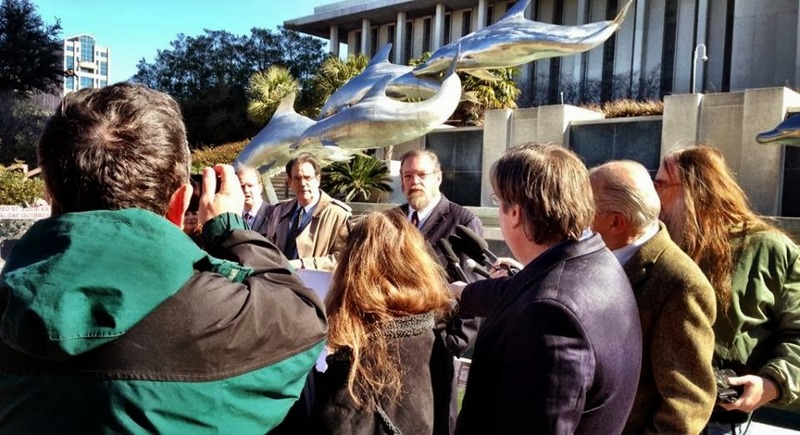 Civic, water and environmental groups from every corner of the state have come together to launch a historic endeavor – a collaborative campaign to harness the resources and energy of organizations and individuals from throughout our state to demand and win the protection of Florida's springs, rivers, lakes, and estuaries. 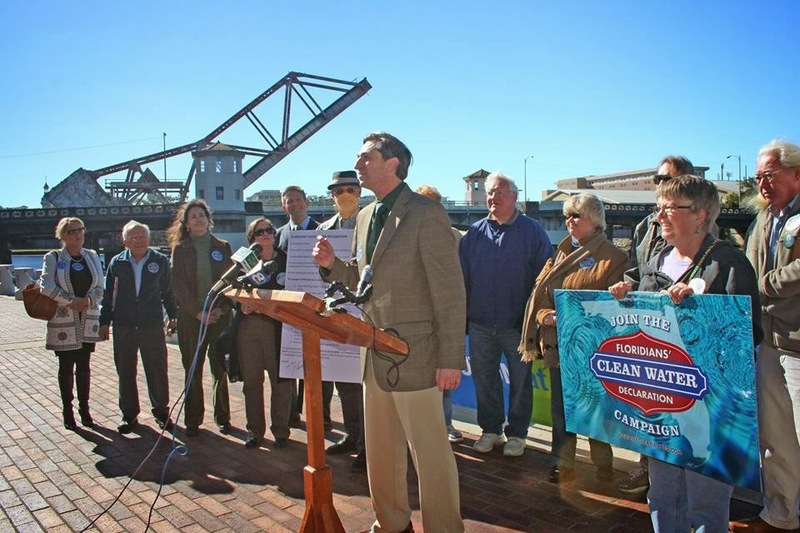 The cornerstone of the campaign is the Floridians' Clean Water Declaration which was developed with the input and support of dozens of environmental organizations. The Declaration lists six rights that should be guaranteed to the people of Florida and four responsibilities of the state government, water managers, and natural resource users. The goal of the campaign is to build a movement; to demonstrate Floridians' overwhelming support for protecting state waters and to create a framework for achieving meaningful policy changes in the future. The campaign's genesis was only two months ago on November 16 when water quality activists from across the state gathered at a Citizens' Summit to begin to explore ways to collaborate at a higher level. For additional photos of the events go to the FCWD Campaign Facebook page. Visit our website www.wewantcleanwater.com to sign the declaration and learn more. Our next big event will be on February 18 when we rally on the Old Capitol steps in Tallahassee - more details to follow! There should be complete transparency in disclosing the volume and identity of fracking fluids, and full and robust public participation before any fracking activity takes place. Without full disclosure, public participation is frustrated since citizens won’t even know there’s a problem until it’s too late. The interests of one industry cannot supersede those of entire communities. Flowback and produced water – spills, treatment, leaching, final disposition of pits – and what happens to the 30% of the injected fluids that are not returned to the surface? Wastewater treatment and waste disposal – contamination of surface and groundwater, insufficient treatment, transportation accidents. · The National Academy of Sciences discovered that homes within 1 kilometer (2/3 mile) were six times more likely to have six times more methane in their drinking water than those farther away. Ethane levels were 23 times higher. · At least 29 toxic chemicals are used in 652 products for fracking. They include carcinogens, hazardous air pollutants, and substances regulated under the Safe Water Drinking Act (except for fracking because of the exemption). Thank you for all you do for the planet! While the Sunshine State has unlimited potential to be a true leader in solar and energy efficiency, creating jobs and a new, vibrant economy for our state, coal-fired plants like Duke Energy's Crystal River Power Station generate soot, smog and toxic mercury pollution that threaten our health, environment and economy. The Sierra Club's Florida Beyond Coal Campaign has a simple message: it’s time for Duke Energy to stop stalling and choose twenty-first century, clean renewable energy solutions for Florida. Simply put, the Crystal River plant is too costly for Duke Energy customers and takes a heavy toll on Florida’s air and water quality. The Florida Beyond Coal Campaign is calling for Duke to phase out two boilers at its Crystal River coal plant by 2016 and commit to clean renewable energy solutions, such as solar, sooner rather than later. However, we have learned that Duke Energy filed a petition with the state Public Service Commission on December 31st that would allow the utility to extend operations of the two coal boilers until 2018. In addition, Duke would be permitted to charge customers for costs associated with the continued operation of those units. TALLAHASSEE, FL. – Today’s decision by a U.S. District Judge allows the U.S. Environmental Protection Agency to avoid applying Clean Water Act protections for two-thirds of all Florida waters, including streams and canals. The decision permits EPA to simply change its mind and not protect most streams and canals. “We are considering an appeal of this decision,” Guest added. Devastating algae outbreaks, like the ones which have broken out on many Florida springs, the Indian River Lagoon, the St. Johns River, the Caloosahatchee River, Charlotte Harbor, Estero Bay, and Tampa Bay are a public health crisis and an economic nightmare – killing wildlife, hurting property values and devastating tourism revenue. Instead of preventing the pollution at its source, the state and EPA have allowed polluter lobbyists to write huge loopholes into rules that are supposed to prevent toxic algae outbreaks. Together, these loopholes leave about two-thirds of streams, canals, tidal creeks and similar waters unprotected from sewage, manure and fertilizer contamination. “This is simply outrageous. The lower St. Johns River has been plagued with a toxic green algae outbreak that tests show is 100 times more toxic than the standards that the World Health Organization sets for recreation,” said Lisa Rinaman, St Johns Riverkeeper. “When you have waters that have 100 times the amount of toxins that the world’s top health experts say is safe, you know Florida’s regulations are not working. This is not the time for the EPA to turn its back on Florida's waters." The public supported the EPA’s action. When the EPA asked the public to comment on the water pollution limits, the agency received 22,000 comments, and 20,000 were in support of the EPA’s standards. In response to a call for action, more than 40,000 citizens wrote the White House. “Instead of protecting people from water pollution, the state is bending over backwards to do the bidding of a small number of politically-connected polluters, like Big Sugar, who just won’t clean up their own mess,” said Becky Ayech, of the Environmental Confederation of Southwest Florida. Florida has also eviscerated the programs designed to manage and prevent this kind of pollution, hacking the budgets of the state Water Management Districts and the Department of Environmental Protection, firing many experienced enforcement and scientific staffers, eliminating the state land-planning agency, and approving these weak, polluter-friendly water standards. Last year, the Legislature even voted down a common-sense measure that would have merely required the state to make public the number of illnesses and pet and wildlife deaths from the toxic algae outbreaks.